The cartography, writing, and ramblings of one crazy winter lover who likes to blog about the fun and inconsequential. This isn't as much a serious delve into alternate history, instead more trying out a technique involving both GIMP and Inkscape. Tell me what you all think! I'm hoping it'll be a nice way to use both methods of mapmaking, and with some inspiration from 1Blomma's Photoshop maps. 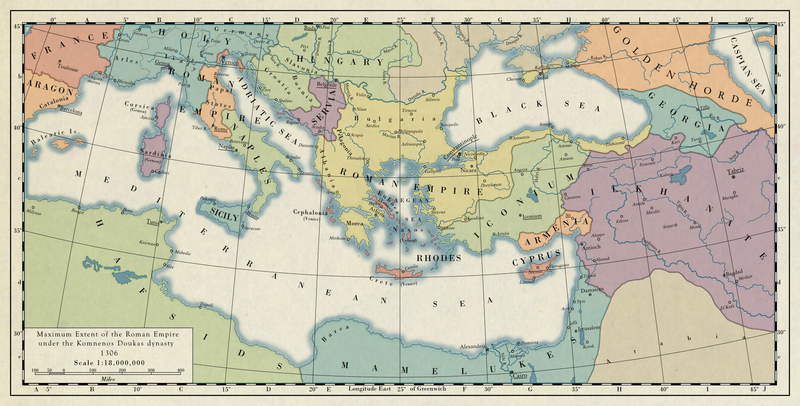 The basic idea of the map is that, rather than the Palaiologoi dynasty taking over the rule of the Roman Empire (or, as it was later known, the Byzantine Empire), the Komnenos Doukas dynasty from the Despotate of Epirus under Theodore Komnenos Doukas succeeded in reuniting the Roman Empire and taking back Constantinople decades earlier than the Palaiologoi. With this earlier success comes a greater age following the retaking of Constantinople for the Romans. Theodore and his successors managed to not just retake the empire but expand its borders, driving deep into the vulnerable Bulgarians and driving out all the Latin Empire holdouts. Even Trezibond is brought back into the imperial fold. This map depicts the Roman Empire at its maximum extent while ruled by the dynasty, specifically under Michael III Komnenos Doukas, who pushed back both Iconium and Servia, the former with a little help by the Ilkhanate who is still set on extending its rule over all Muslims in the Middle East. Under Michael III, the Roman Empire has become a powerful force in the region once again, showing off the muscle that once ruled most of the European continent. However, misfortune strikes the Komnenos Doukas dynasty shortly after Michael III's death, as both his sons had died and rule is passed to a young nephew who, after a short rain of 1307-1311, abdicates in favor of a new family: the Palaiologoi. Though in our history they lost their empire, the Palaiologoi of this world come into power at the helm of a much stronger Roman Empire, one flush with trade and business and blessed with a strong military. However, both Iconium and the Ilkhanate border on the edge of collapse, which could spill chaos across the whole of Asia Minor. Even by 1311, Trebizond is ruled only in theory by Constantinople. Meanwhile, in Europe, the Golden Horde is a major threat to the east, while the Hungarians and Holy Roman Empire, as well as the rise of Venice and Genoa, threaten Roman sovereignty. Only time will tell whether the Roman Empire will whether this crisis as they have before, perhaps even growing stronger by taking advantage of their enemies, or whether, as in our world, the Palaiologoi will be the last rulers of Rome.